The prequel to John Carpenter's classic horror film will invade Blu-ray in January. In an early announcement to retailers, Universal Studios says 'The Thing (2011)' will have a Blu-ray release on January 31. It’s not human. Yet. From the producers of 'Dawn of the Dead' comes the chilling prelude to John Carpenter’s cult classic film. When paleontologist Kate Lloyd (Mary Elizabeth Winstead) travels to an isolated outpost in Antarctica for the expedition of a lifetime, she joins an international team that unearths a remarkable discovery. Their elation quickly turns to fear as they realize that their experiment has freed a mysterious being from its frozen prison. Paranoia spreads like an epidemic as a creature that can mimic anything it touches will pit human against human as it tries to survive and flourish in this spine-tingling thriller. 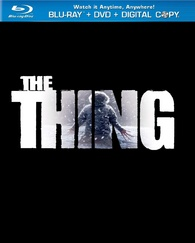 The Blu-ray/DVD/Digital Copy combo pack will feature 1080p video, a DTS-HD Master Audio 5.1 soundtrack, and supplements include Commentary with Matthijs Van Heijningen and producer Eric Newman; The Thing Evolves; Fire & Ice; and deleted/extended scenes. You can find the latest specs for 'The Thing (2011)' linked from our Blu-ray Release Schedule, where it's now indexed under January 31.